The silver bubble took on a new dimension this month, with the price of the metal rising nearly 30%. Last Monday, share volume in the iShares Silver Trust ETF (NYSE: SLV) was five times its daily average in the first quarter. While many investors may cite capital preservation as a reason to buy silver, an analysis of the historical data suggests that those who pay nearly $50 an ounce will eventually suffer massive losses. Like gold, silver has lived up to its billing as a store of value -- if you measure your holding period on a geological timescale. 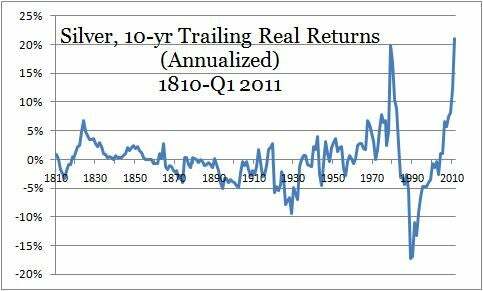 Using data from precious-metal dealer Kitco, I constructed a series of inflation-adjusted silver prices going back to 1800, according to which the metal generated a historical average return of 0.4% per annum. (Much of that small premium over inflation is due to price appreciation over the past 10 months. If we use the price of silver in mid-2010, the average annual return falls to 0.1%). Source: Kitco, Federal Reserve Bank of Minneapolis. Beyond the volatility, the graph also shows that silver returns are mean-reverting. The alternating peaks and valleys in the graph illustrate the fact that periods of higher-than-average returns tend to usher in periods of lower-than-average returns, and vice versa. That's not surprising, as this property shows up across many different assets, including stocks, bonds and gold. Investors who have owned silver over the past 10 years have earned spectacular returns, rivaled only by those earned during the 1970s, a decade which ended with a huge spike in silver prices resulting from the Hunt brothers' attempt to corner the market. Silver then performed disastrously during the following decade, losing more than four-fifths of its inflation-adjusted value. Both the previous chart and the inflation-adjusted price chart below suggest that we are on the eve of a similar period of horrific losses. Silver could fall by two-thirds! 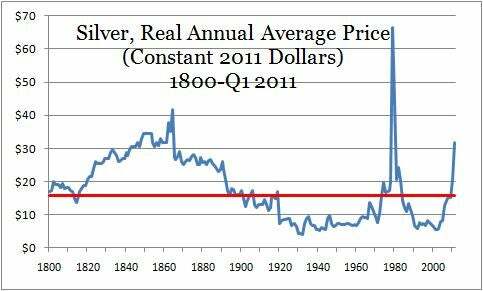 Silver prices are now well ahead of their historical average (the red line). The chart doesn't do justice to the extent of the gap that has opened up with respect to a fair price since it ends on the average price of silver during the first quarter of this year (roughly $32), whereas daily prices are now close to $50. In fact, the price of silver would need to fall by nearly two-thirds to get back to its long-term average of $18/ ounce -- not to mention that markets typically overshoot. Two-thirds is roughly the same size decline I expect to witness in gold prices (see the associated article on gold here). Both precious metals are in a bubble and, with silver's most recent price surge, the two bubbles are of similar magnitude, which is consistent with a gold-to-silver price ratio (31.5) that is close to its long-term historical average (36.7). How many angels can dance on a silver ingot? Silver is in a bubble, but I'm not predicting an imminent fall in its price. With silver at $50, who is to say it can't reach $100? I can certainly imagine that scenario. Once irrationality and speculative mania take hold of a market, there is no measuring how far the excess will run (except post-facto). It's impossible to time the bursting of a bubble; it could happen several months from now, just as it could take several years. My best guess is that silver prices will decline significantly by the end of 2012, with multiple interest rate hikes by the Fed as the catalyst. But that is nothing more than guesswork; the only thing I am reasonably confident of is that the price will ultimately decline by roughly two-thirds. In that context, owners of silver bullion and the iShares Silver Trust should accept that they are playing with fire. Shareholders of silver miners Coeur d'Alene Mines (NYSE: CDE), Silver Wheaton (NYSE: SLW), or Pan American Silver (Nasdaq: PAAS), or the Global X Silver Miners ETF (NYSE: SIL) should review the assumptions regarding silver prices that are implicit in the miners' valuations. Do I need to mention that silver owners shouldn't seek an alternative in gold bullion or the SPDR Gold Shares? With gold prices at historic highs, one little-known company is making a fortune. Find out the name of "The Tiny Gold Stock Digging Up Massive Profits" by clicking the link.